It seems so simple. If there’s a sign warning you of danger and to “Keep Out,” you should. So how does a 23-year-old, college graduate—who had worked at a nature preserve in Oregon and was familiar with the concept of preserving and protecting natural landscapes—walk 225 yards off the boardwalks near Yellowstone National Park’s fragile Norris Geyser Basin and burn to death? 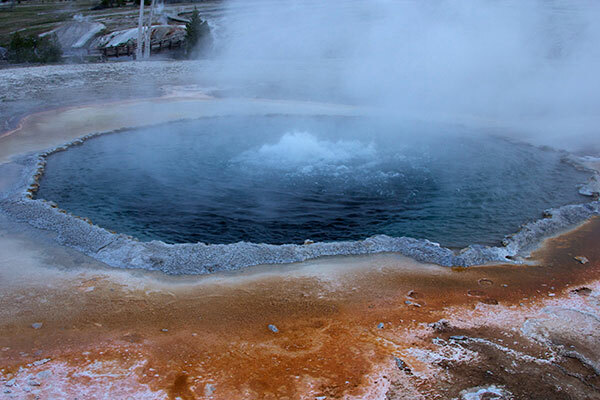 Was it because the thermal pools are entrancing and so enticing that he couldn’t resist? Was it because he wanted to get a better photo or selfie for social media? Or did he simply believe, like so many people in our wild places lately, that the rules did not apply to him? And, what should the National Park Service do to protect us from ourselves in our most beautiful places? 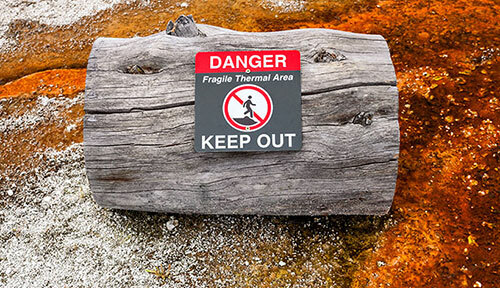 Since 1888, rangers have posted warning signs at Yellowstone National Park’s hot springs; and since then, some have ignored them. 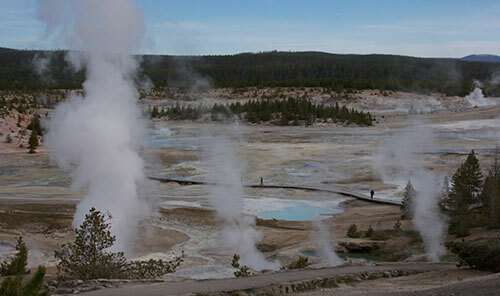 To help with that problem, a system of boarded walkways was built in the 1960s that would allow people to safely see the geothermal features without harming the delicate ecosystem. Unfortunately, off-trail wandering persisted. • In mid April 2016, a tourist approached within arm’s length of an adult bison in the Old Faithful area and petted it. The event was captured on a video that went viral. The bison, which was lying down, reared up but did not charge. The animal, in my opinion, showed a lot of restraint. • On May 9, 2016, a Canadian man and his son violated park rules by loading a bison calf into their car out of concern it needed help. The bison was later euthanized because of that human contact. • In mid May 2016, a group of young Canadian tourists walked onto the sensitive Grand Prismatic Spring, filming their exploits for social media and an online adventure series. They snapped selfies and dipped their hands into water that can reach the boiling point. • In May 2016, a woman approached within a few feet of a cow elk, which charged her. She was unharmed. That list would be longer, of course, if you expand it out just a few years. In 2014, a tourist from the Netherlands paid a fine of $1,000, as well as $2,200 in restitution, after crashing a drone into the Grand Prismatic Spring. Later that year, a German tourist was fined $1,600 and banned from the park for a year after crashing a drone into Yellowstone Lake. Narcissism, social media or just plain human curiosity? Clearly, social media—with its siren call for bigger, better and more daring photos—is fueling a lack of regard for rules everywhere. But other factors could be playing a role, too. Narcissism and the age-old lure of nature come to mind. Narcissists believe that they can cut into a line where others are waiting, cheat on their taxes and ignore rules that get in the way of doing what they want. Since narcissists see themselves as above others, rules don’t apply to them; they are for other people to follow. Studies show that we are living in an increasingly narcissist society. Facebook must take part of the blame for that, surely, but so must a currently popular parenting style that, among other things, lavishly praises children for skills not mastered and talents they do not possess. Some say, however, that people exhibiting bad behavior around the geological features of Yellowstone might simply be caused by the allure of those features themselves. The waters of the hot springs are hued and tinted in unearthly colors: vibrant blues, rich greens, bright yellows and deep oranges. They resemble cosmic nebulas filled with fascinating mysteries, drawing visitors off the boardwalks and marked pathways to stand on their rims and take a closer look. One of the signs that warned visitors not to stray from the boardwalks that surrounded the hot springs in Yellowstone National Park pictured an illustration of a boy falling through the thin crust and a woman pointing in horror. Yet, such graphics don’t appear to be enough to keep people from walking onto the geothermal features. The National Park Service recently issued a new statement about safety. But will we all pay attention? I’m afraid not. Perhaps the answer is to construct plexiglass domes over the boardwalks, so that people must trek through transparent tunnels in order to observe the natural phenomena, keeping them on a safe path and saving them from themselves. Or maybe we just accept that some of us, through our bad decisions, will always die in Yellowstone. 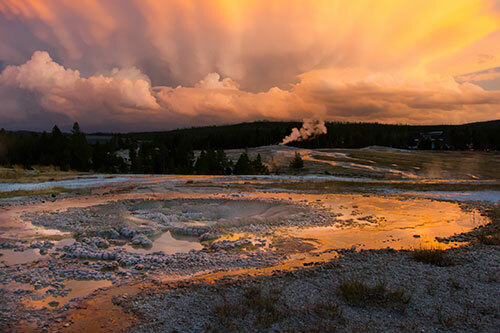 If bad behavior continues to increase in Yellowstone National Park, what measures do you think we should take to protect the landscapes and the people who visit? Natural Selection in action. Why do we shield stupid people from their stupidity? Strong barriers should be added along with warning signs to safeguard tourists. Before leaving path, please write a short obituary for the news. Thank you. The boards are there for a reason. Having been to Yellowstone the guides make it quite clear not to go off the boards. Perhaps the signs should all prominently say “ENTER AT YOUR OWN RISK”? As a Park Ranger myself, I think that the best way to keep people from disrespecting the resource and disregarding valued signs is to have more park rangers in the resource with the ability to enforce AND educate. People genuinely lose their minds the moment they go into a wonderful park and having someone around to tell them “no, don’t take that bear selfie” or “no, you can’t go swimming in that boiling lava pit” is our best option. If we have too many signs then we become numb and then we may as well have no signs at all. And let’s face it, we don’t read signs when we’re looking at the majesty of nature. But we will listen to someone standing there watching us and telling us we can’t do something. Maybe it is time to get rid of the signs. Didn’t road accidents decrease somewhere when they removed all road signage and let people work it out for themselves? I spent two seasons wearing the flat brimmed hat, one season in Yellowstone. Internally we had a term we used: “Tourons” (aka moronic tourists). There was an obvious reason for that term after sitting around trading stories of stupid things that we would see over the course of a day, week, season. I think people associate a park visit with a visit to the local zoo (although some have found zoos not very safe either – lately). I would second the Darwin Award nomination and suggest sending the scenario to Gary Larson (Far Side). Having visited many tribal parks , similar to other countries, very little in the way of structural safeguards. No different than on our highways, if you protect people, they drive with less caution. Send a city driver to the country with no street lights= paranoia. If people see the standard of handrails, they feel that anything that can hurt them has been isolated from their reach. There are always those that know better, but ignore the obvious. We must not forget that the rules of nature also apply to us. Survival of the fittest…those not intellectually fit enough, or perhaps too arrogant to accept that the rules apply to them too…well, maybe the human race could do without those genes. Harsh words, yes…and to the loved ones of the “victims” it may sound insensitive. But that is just my opinion. If rules (and therefore signs) were not necessary, they would not be there in the first place. When signs are not enough, let the narcissistic and foolish and willfully disobedient reap the consequences without liability to the park or park staff. Beyond signs, the next step would be more park rangers with law enforcement capacity; and yes, park fees would have to increase to pay for such staffing if we want to try to prevent people from ignoring warning signs and putting themselves at risk and forcing others to witness the outcome. I live near Yellowstone and Grand Teton National Parks on the south side, I grew up on the east side. I don’t recall these seemingly senseless acts occurring when I was young, and the frequency is increasing dramatically over the last few years. It would be interesting if visitors had to pass a test to get into the park. I do not want glass bubbles or high fences or ANY form of idiot proofing in National Parks or National Forests. We are paving over every mud bog and fencing off every cliff edge in the same of safety. Sometimes people die and sometimes it’s because it’s because they were dumb and sometimes it’s because they were unlucky. If we have done a reasonable job of making the dangers clear, that is enough. Idiot proofing the world tars the world in a way that I don’t want to see. the wild is dangerous and it should stay that way to an extent. Okay, I am jumping off my soap box. I considered mentioning the Darwin Awards, but I thought, “let nature take its course” would fit nicely here instead. I have also visited and it is quite clear from signage that it is dangerous and prohibited to stray from the path. The chance of the narcissistic and thrill seekers ignoring signage is always there. A glass tunnel is not the answer. We would end up in glass bubbles as individuals to avoid calamity in daily life. Instead, I think heftier penalties with posted “fine signs” stating the cost of straying from the path may help. Also signs could include a cartoon version of “death by boiling water”. If such additional signage stills fails to keep people off the path… (this may sound brutal and be offensive to some) I say, let nature take its course. I have had the luck to visit this place, can’t really imagine that someone would feel for jumping into that. Last year so I heard thirteen people were killed by accident when they were selfying themselves in different situations. We might have gained a few things over the last couple of decades but obviously we also have lost some basic human stuff. People are just plain stupid or daring and death does not frighten them anymore. The death of any living thing is tragic. But, just because a person chooses not to use common since, and chooses not to use good judgement or they just have the entitlement syndrome should not prevent others from enjoying our State Parks, National Parks. It is a shame that a small few can cause instigation of regulation that would limit the personal experiences of the masses who do use good judgement and that are respectful to others and nature. When will we as individuals and governments accept that we can not protect everyone (nor should we). I have a saying “Can’t Help Stupid!”. It’s impossible to regulate stupidity….At some point people have to take responsibility for their own actions and live (or die) with the consequences. This may sound brutal, but we as a society just need to make sure we attempt to educate people and hope they use common sense. We don’t need to ruin it for those of us who are able to abide by the rules by building physical barriers due to those narcissistic individuals who don’t abide. I think if these fools aren’t actually damaging the natural features or the wildlife, then its their own fault if they get hurt or killed- perhaps evolution will eventually naturally select those of us that aren’t stupid enough to die for a selfie. I don’t think that 22 people killed in over a hundred years by their own stupidity warrants the need for fencing out the rest of the rule abiding thousands who visit everyday. I do however think that some people may actually be doimg some damage, and so people who do break the law by approaching wildlife or walking off the broadwalks should be much more heavily penalised- as a deterrent, and as a penalty for the damage to the natural features- but not for putting themselves as risk. Thats their problem. I have noticed the same thing—only in South America. The liability laws must be vastly different there, for sure. —C.G.A. John, I also admit I have suffered from the “photographer’s syndrome,” too. It’s so tempting to think you can get “just one inch closer, then just one more inch closer” when you’ve got a camera in front of your face. Sometimes, I have to put down the camera and call myself back. And, yes, those name changes in Yosemite are perplexing. —C.G.A. We see this behavior everywhere. People swimming where there are riptide signs. Standing on dangerous cliff edges. Getting too near animals. And photographers wanting the perfect and unusual shot. And Yellowstone has become the Disneyland of National Parks. In the summer it is a LA traffic jam. People are stupid (see Darwin effect). And I admit I have done some stupid things for a shot. But I would hate to see plastic walls in Yellowstone, or any other park. Now let’s bring up the stupidity of changing the names of revered places in Yosemite. Joan, my husband and I were in Iceland last month and we thought the same thing!! No guard rails or signs warning people not to get too close. Where has common sense gone these days?? Maybe it’s too easy to to blame someone else for their own stupidity. I don’t know the answer, but it make me wonder also….why the difference! About 10 years ago my husband and I traveled in Iceland for about 10 days. There were many incredibly beautiful waterfalls to see, with rocky cliffs and abrupt drop-offs, and at most such sites there were neither guard rails nor warning signs along the paths. It was assumed that people had good enough sense not to do something stupid (and if not – TOO BAD). I’d be interested to know how liability laws differ between there and here, but it seemed an eminently sensible policy.